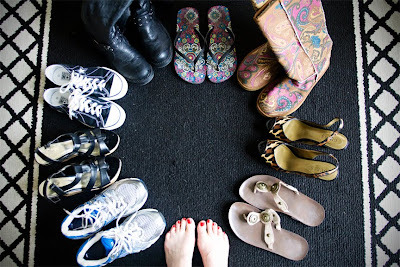 What I love about shoes is that I can ask myself, who do I want to be today and the shoe can help define that:) Gym rat, professional, casual and fun, rock star, yoga chick, hippy, hottie and so on. As a true Gemini I have multiple facets to my personality. And the shoes bring out the best of each one:) I wear these shoes pretty often except for the leopard print, peep-toe, sling back stillettos. They're new and have only been out of the closet once. They definitely need to get out more!